Central Arizona College senior Candecea Bernard’s outdoor season has been on track. The Jamaican threw 51-5½ft (15.68m) in the shot put to finish fourth in the invitational section of the event at the April 2 to 4 Florida Relays. Before Florida, Bernard finished as runner-up in the shot put at the Crimson Tide Invitational with a throw of 51’-10½” (15.81m), hurled the discus 132’-3” (40.31m) to place 17th at the Alabama Relays, and won the shot put at the Alabama Relays with 51’-1½” (15.58m). These performances came on the heels of her 2015 indoor performances when she placed tenth in shot put at SEC Championships with 49’-10½” (15.20m), a season-best 50’-11½” (15.53m) in the Tyson Invitational shot put, and a season best tie in the shot put at 50’-7½” (15.43m) for fourth at the Frank Sevigne Husker Invitational. She is the first female discus thrower in Jamaica to qualify for the World Junior Championships. Meanwhile, Bernard’s compatriots in Jamaica are revving things up going into the Penn Relays, the World University Games and the Jamaica Senior Championships. Megan Simmonds of the University of Technology (UTech), in photo, blasted to a sprint hurdles record of 12.91secs at the recent InterCollegiate track and field championships in Kingston, erasing her own mark of 13.28. She was followed home by Chrisdale McCarthy in 13.17 (also inside the old mark) and World Youth champion Yanique Thompson of G.C. Foster College in 13.33. Simmonds’ time ranked her fifth fastest in the world this season behind Australian Sally Pearson’s 12.59, 12.71 and 12.74 and another Australian Michelle Jenneke’s 12.82. 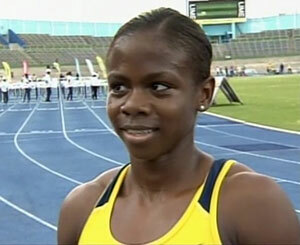 UTech’s Elaine Thompson clocked a big personal best 11.01 to win the women’s 100m, running into a headwind of 1.1 mps. Her previous best was 11.17, and this was her first 100m race of the season. Her time broke the InterCol 10-year-old mark of 11.33 set by Sherone Simpson. Team mate Chanice Bonner was second in 11.44, and GC Foster College’s Kedisha Dallas placed third 11.49. And UTech’s Julian Forte was in the spotlight again, when he took the men’s 200m in a record of 20.19secs, breaking Asafa Powell’s 2002 mark of 20.93. G.C. Foster College’s Colin King was a distant second in 20.87, with his teammate, Brandon Thompson, third in 20.89. University of the West Indies’ (UWI’s) Delano Williams and UTech’s Kevan Smith failed to finish. 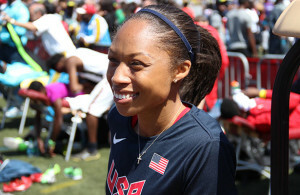 Forte’s time was the second fastest in the world this season behind Pako Serbia of Botswana with 20.17. In the field events, UWI’s Shalke Thomas, a former National Collegiate Athletic Association (NCAA) Indoor and Outdoor champion in the triple jump, won the event with a record 13.12m to break the old mark of 12.67 set in 2008 by Megan Reid. Next Story → Will She or Won’t She?